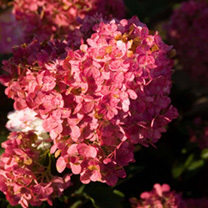 Hydrangea paniculata Vanille Fraise ('Renhy') is a deciduous shrub producing large panicles of flowers in summer. The flowers open creamy white, gradually changing to shades of pink and then red as they mature. A delightful addition to a mixed border, this attractive plant also makes a good specimen shrub. Best in partial shade, in soil that does not dry out in summer. Flowers July-September. Height 150-200cm. Supplied in a 3 litre pot.